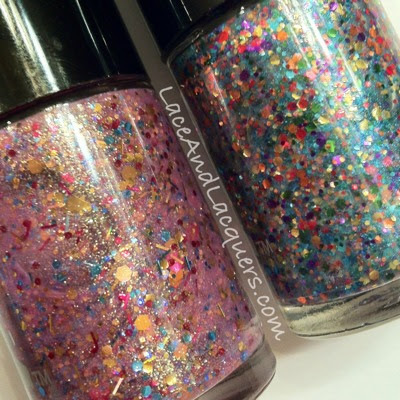 Today I have 2 glittery polishes from Rainbow Honey's new Equestria Collection! I chose Pinkie Promise and 20% Cooler to pre-order awhile ago... Welp, the same day I got these in the mail RainbowHoney.com opened and I had to order too more bahaha (story of our lives, right?). Click on over for swatches and reviews! Even the bottle shots make clicking over worth it! As promised, here are ze bottle shots! Yum! Just look at ALL THAT glittery, shimmery goodness! I always want to try polish mixing and then something like this comes along and then I think "my polish would never look that amazeballs" haha. Shower Together (which I just bought and it's amazing!) 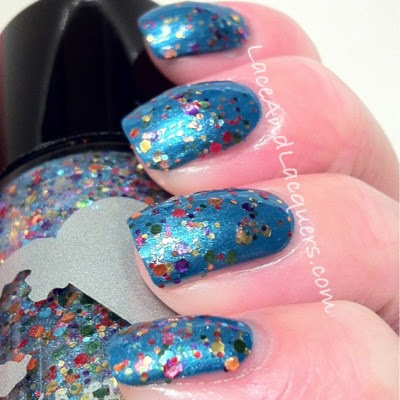 by China Glaze for 20% cooler and Zoya Sweet for Pinkie Promise. 20% Cooler is described by Rainbow Honey as: "A shimmery and sheer light blue base with a veritable rainbow of glitter that promises to make any old manicure at least 20% Cooler". This seemed to be the one that everyone was snatching up in pre-order and it's obvious why. This polish is so much fun! It applied pretty smoothly and 1 coat made my manicure good to go. I was surprised how flat the glitter was on the nail, most swatches I saw made me second guess because it looked kind of thick. If you're thinking of grabbing this, do it! 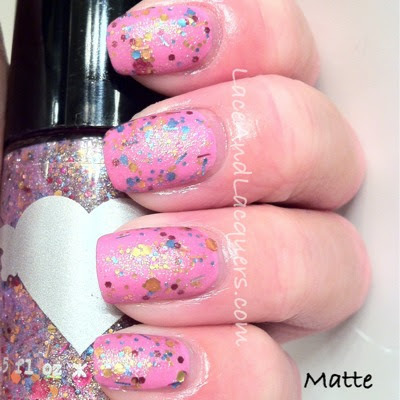 This was also 1 coat of Pinkie Promise over Zoya Sweet. I was surpised how much I ended up liking this polish! (PS: if you haven't seen it over black yet, google it - it's amazing and a half!) 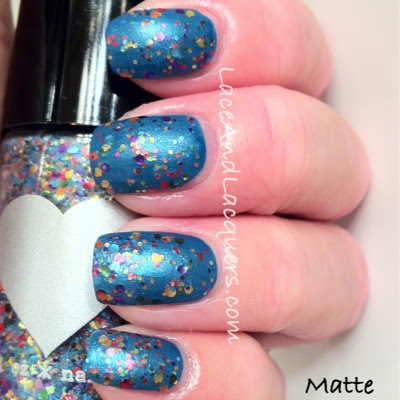 Rainbow Honey describes as: "A fun and shimmery pink base filled with hex and tinsel glitter in magenta, light blue, and gold - this polish calls for a party!" And that was exactly what I thought of lmao, a party on my nails! This is my favorite from the collection so far! And like my last Rainbow Honey post (and my first bahha!) I applied a matte top coat, I had to to do the same here! You can find 20% Cooler, Pinkie Promise and more from Rainbow Honey at www.rainbowhoney.com for $10/bottle (well worth the money, ladies!). You can also find Rainbow Honey on Facebook. They remind me on confetti :) cute!